It’s been a tumultuous year for gay lady geeks as we’ve soared and plummeted along the broken tracks of the mainstream comic books roller coaster. 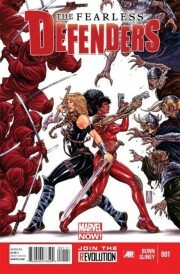 Up we went when Marvel released “Fearless Defenders,” an all-female team-up with a brand new lesbian character! And down we went when they killed off Dr. Annabelle Riggs in issue #6. Up: Batwoman proposed lesbian marriage to Maggie Sawyer! Down: Batwoman‘s creative team resigned in a very public way because DC refuses to let them go through with the wedding. But we’re on another upswing: “Fearless Defenders #10” hit stands last week, and introduced us to a new character called Ren Kimura, and guess what? She’s a lezzer! Posted October 16th, 2013 & filed under Entertainment.